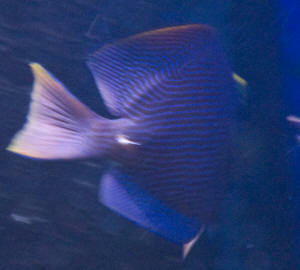 I ordered a small-medium Kole Yellow Eye Tang from Liveaquaria.com in the Diver's Den section. The fish was supposed to be quarantined before he was sent to me. When I received my Tang he was very stressed and not looking very well. He was breathing very heavily and refused to swim around. I acclimated him slowly using the drip method for over an hour to try to let him calm down a little before messing with him. so I decided to skip it and wanted to use a dip. But after over two hours of acclimating he still wasn't swimming or breathing normally. I was worried that the dip would stress him out more and because he was supposed to be quarantined before I got him I wasn't too worried about putting him in my 60g. After a day with the lights out he was doing much better swimming and eating normally. After day two I started to notice what looked like small dots on his face. They weren't white and they looked more like small circular chunks of his face had been taken out. And when I say small I mean like grain of sand small. They then began to spread up his face and towards his eyes. As the spots got farther up they turned into huge oval chunks. You can clearly see that the skin is missing. He also does this weird thing where he swims up to the glass and spreads all of his fins and swims backwards very quickly. He loses all of his color in the front part of his body while the back becomes very dark and his pupils get very large. He will have four or five of these 'episodes' in a two minute time span. The worse ones his whole entire face is white almost see-through and his back half is almost black. At the end he hides in his cave and breathes heavily and then continues on eating. He will have one 'episode' every half-hour to an hour. Usually this happens more in the morning almost non-stop. Is he reacting to his reflection? I tried putting cardboard in front of the tank but he just kept doing it. The first thing I thought is HLLE so I tried giving him green, red, and brown dried algae and seaweed strips but he has never touched them. He eats mostly Formula 2 Flakes, Frozen Vitamin-Enriched Brine Shrimp, Spirulina Brine Shrimp, 50-50 Plus, Instant Ocean seaweed blend, Cyclop-Eeze, and Mysis Shrimp.. He also picks at the rocks all the time. Then I noticed the spots spreading to my other fish 3 Green/Blue Chromis, a Royal Gramma Basslet, and my two clowns a Saddleback and a Ocellaris. The spots start around the eyes and spread and get bigger as they spread. Any idea what it could be? Before the Tang there was nothing wrong with the tank. All of the fish were healthy. The tang also seems more aggressive than what he should be. It's probably from being stressed from being sick but he is constantly trying to pick fights with my Saddleback and the Chromis. He also has had his scalpel out for more than a week. I thought the spots would go away with a wider diet and I added Herbtana to their food to try to boost their immune systems. The spots seem to have stopped growing but is this going to work long-term? I want to find a treatment that will work on all the fish. I might have noticed some scratching against the sand from my Saddleback and the Tang but they only did it once so I'm not sure if that's an actual symptom. Here is a video of the Tang and his face. The before video when he just had a few bigger circles around his mouth and an after where they are everywhere. I also tried to get a video of him doing the swimming thing. I got a picture of the spots on my Royal Gramma but they aren't nearly as noticeable and none of the other fish display any other symptoms besides the spots. Any help at all would be wonderful! Thank you. I'm so sorry about the videos I tried to make them smaller but I'm terrible with technology. Hi guys, thanks for your time. I've read many of your responses on Tang care and disease, and wonder if my Kole Tang has just run its course and is simply old, or if it is salvageable, will quarantining it do more damage than good. as are the 3 clowns and 1 Kole Tang. We have included other fish and cleaner crews throughout the years, but these 4 fish have been through it all. along with the 4 we have 1 yellow goby with its pistol crab mate, 1 cleaner shrimp, 1 six line wrasse, and 1 blue Chromis along with several types of snails and crabs. The ph is 7.8, nitrates 0.2. The water quality has been consistently "fine" not great, can always use an extra water change, but the Kole has adapted all these years. It's been hot here, and since the Kole has been upset I've turned the lights off ( with pumps running) for a day or two. The past 2 days the Kole Tang has been attempting to keep its equilibrium in one place, not cruising the tank and not eating. He is not pursing his mouth at all, just keeping it open. Therefore, he is not cleaning the glass or rocks at all and when I feed him garlic flakes or Mysis as usual he is not taking the bait. His face and body are very thin and his color is faded, sort of too green and sickly. He has what looks like a minuscule dot of sand on his tail that has not spread. If you notice my first picture then shortly thereafter subsequent pictures further down the page with corresponding info. I thought that adding a reference link would help save on email size. ... and here are some images attached. 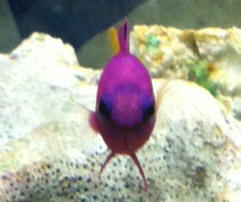 I have a Kole tang (obviously) and a bicolor blenny in QT. If it's wet - I quarantine it. Shortly after being introduced to quarantine, the tang began to scratch. No surprise. As always, I use Cupramine at .5 mg/l concentration. While I was slowly getting the tank to the right level, I noticed what appeared to be salt on the tang - only a couple dots, so my first thought was Ich had taken hold before the copper was set correctly. However, after a few days I noticed what appeared to be very thin, small clear pieces on the fish. My next thought was flukes, but I can't say for sure if it was that or not as I am not experienced in seeing/dealing with flukes. What is the issue with the tang? 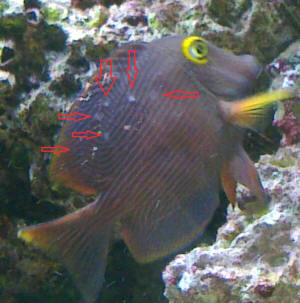 Can you tell if it is flukes or Ich - and what is the spot on it? You cannot see it in the pictures - but there is a clear "salt" looking spot on its ride side (in person). Just to clarify - you say it is chemical damage due to Cupramine... are you referring to the round oval spot on the tang? Also, is this reversible with time? It does appear to be doing much better now and I just picked up some NLS pellet food to add to it's diet - in addition to all the other various foods. 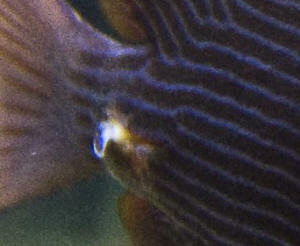 Last but not least - do you have any idea as to what the small dot on its right fin may be? My first thought it always Ich but I don't believe Ich attaches itself to the fins of a fish? I didn't notice a reply to my 2nd email to you (but did on the website). 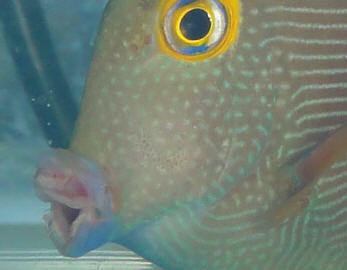 My 3rd/last question is in regards to the color of the Kole tang, on the under-side of the mouth and around the gills. In one of the previous email pictures attached - you can see it has a shade of blue/purple to it. I just did a water-change in the QT and I noticed this dark blue was more pronounced - can you shed some light? 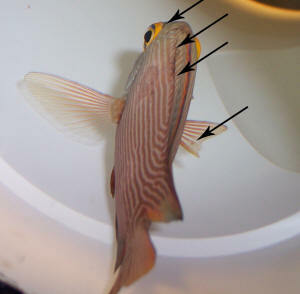 I e-mailed you guys a few months ago to clarify about an article and Mr. Fenner responded, I had read his article on Kole Tangs, and his recommendation was to skip the QT process with this species, but to use a freshwater bath instead. I followed his advice, and everything was going fine for a week or two. Then the Ich showed up. I have a 75 gallon aquarium, with a 20 long sump. 0 ammonia, 0 nitrites, 0 nitrates, pH is 8.1-8.2, constant 78 degree temp. The only tankmates are a pair of ocellaris clowns, royal gramma, 3 green chromis, yellow watchman goby/pistol shrimp pair, and a skunk cleaner shrimp. I have approximately 65-70 lbs of live rock as well. 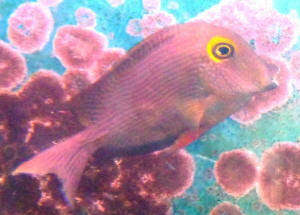 The Kole tang is the only one to show symptoms of Ich, but I never saw him flashing against the sand or rocks. Occasionally I'd see him rub his mouth against the rocks, but he was still aggressively eating and grazing on the rocks. Other than the white spots, there were basically no signs of any problems. Then last week he became very lethargic and would still eat, but didn't seem as eager to be fed as he previously was. I decided to pull out my hospital tank and treat with hyposalinity. I have a cheap power filter, and the sponge and "bio media" have been sitting in my sump for several months, just in case I needed them. I set up my hospital tank (20 gallon long, bare bottom with PVC elbows for hiding places, a heater, and the filter with cycled media) and have all the fish in the hospital tank and will let the tank sit fallow for 2 months. 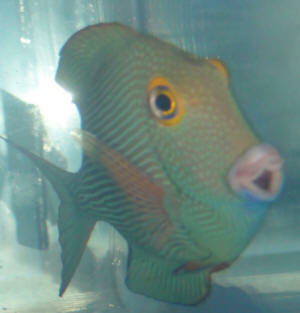 I lost one of the 3 green chromis in the hospital tank last night. Back to the Kole Tang. Starting last night, I noticed he was laying on his side inside one of the PVC elbows, but he was still breathing. I nudged the PVC and he started swimming upright and came out of hiding for a little while, then went back in and laid down. I see my clowns laying on their sides every night sleeping, but have never seen this behavior with the Kole Tang, and was wondering if this is normal. I just tested the hospital tank water and it showed no ammonia present, but today he is still laying on his side. His color is darkening back up, and he actually "looks" healthier than he did 2 days ago when I decided to treat for Ich, but his behavior is somewhat startling. Do you have any tips or suggestions (or explanations) for what's going on? I hope I've covered all my bases on the information you'd need! Thanks again, and I love your site!!! Thanks for the quick response! I guess I forgot to mention that I am going the hyposalinity route. I'd appreciate any advice you could give me about my Kole tang. He's swimming a bit sideways, and his mouth is open all the time. There's this white stuff lining his lips as well. In addition, he has a bump on the side with an indentation in the middle of it, like a donut. I attached a picture for you to see. I noticed him like this today; however, I just came back from a week-long trip and I'm not sure how long the fish has been like this. Everything looked fine before I left for vacation, and a water change was done before I left. This tang's been in the system for 2 years. The tang usually eats the small marine pellets by Omega One, as well as algae from the rocks. Are you saying that there's no disease here, and what I'm seeing is the result of starvation? He shows interest in the food now but doesn't actually manage to eat anything. So, this past Monday, after much research and consideration, I purchased a Kole Tang. I brought him home and gave him a five minute pH adjusted fresh water dip (no MB, as I haven't found it locally yet), then settled him into his 10g QT which had been filled two days prior with 50/50 new water and tank water from my display. There is a small heater, Maxi-jet 400 and Penguin bio-wheel 100 (the wheel had been curing in my display since boxing day, it also has a small amount of carbon in the filter pad), and a 3" dia pvc t-joint. Everything looked good. He immediately hid away in the pipe and would poke his head out from time to time. Yesterday morning, he was cruising around the tank, looking for food, so I dropped in a small piece of Omega One sinking veggie pellet (about 1/4 of a pellet). He immediately took to it, and ate about half. After 5 minutes, I pulled out the remaining bit with a baster. Last night I gave him another small piece, which he ate all of. I checked parameters, amm/nitrite//PO were all 0 and nitrate was slightly darker then 0 (not quite up to the 5ppm colour, this is using an API kit) SG was 1.024. I had intended on doing a small (1g) water change today, but when I got up this morning, he was back to hiding in his pipe and respirating very heavily. I immediately checked parameters again, and everything was the same, except nitrate had climbed to a little over 5ppm. I did a 50% water change instead, and nitrates are back down to a little more than 0.
and a bit of green hair algae to munch on. Aside from respiration, he looks fine, though he's a bit hard to see in the pipe. Should I stay the course? Move him into the display? He's an awesome little dude and was so happy and feisty yesterday, I hate seeing him hidden away and clearly in trouble. That's a great .pdf, thanks! Okay, I pulled the clowns out and popped them into a bowl with display water and a lid, to give Kole a chance to get into the tank unharassed. The move didn't go perfectly, his tale spiky deals got a little caught in the net, and he had to fight a bit to get out. He immediately headed into the rock work, and stayed there for a while. After about 15 minutes I put the clowns back in (they're a tough pair, well established, but I don't like giving them a hard time either), and they seemed oblivious. Kole started showing himself, cruising around down low in the column, while the clowns stayed near the top, where they generally hang out. 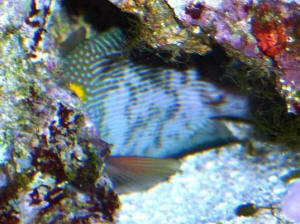 He was already picking at some green hair algae on the rock, though he's still breathing pretty heavily. Keeping an eye in the hopes to see it drop as he settles in. I have had a few better views and still don't see anything that speaks of disease, though both the cleaners have attempted to give him a going-over. He keeps flicking them off in favour of cruising for algae, which I'm hoping is a good sign (hoping if he were in discomfort from Ich or whatever, he'd welcome them. Could be noob wishful thinking....). I'm going to leave the tank lights off for the day and just keep an extra close eye on everybody. Haha, read that email while sitting in front of the tank. I've moved now, and turned off the overhead lights too. I'm not going to obsess, I'll just take a quick peek a few times throughout the day. He was swimming in a moderate flow area, not doing much but very heavy breathing, but like you suggested, I'll leave him be. I'll leave you guys alone too, unless something drastic changes. As an aside, I opted for the bowl thinking that I was trying to keep them separate for the move, and at some point they would have been in the same quarters if I didn't use it, and while I could have moved the clowns from the bowl to the QT after Kole was out, keeping them in the bowl for 15 minutes meant I could simply gently pour them back into the display, rather than having to net them again (the female was not impressed with being removed). While they are small (I've forgotten and didn't note it when I bought them, but they're aquacultured clowns, and I think ocellaris/false Percs), the female has shown some aggression in the past (had a go at both cleaners when they were introduced, and occasionally tells my hand it's too close), so I thought better safe than sorry. Kole headed for the rock so quickly I doubt it would have been a problem, but live and learn. They seem happy and back to normal, anyways. Thanks again, have a great day, and like I said, I'll leave you and the Kole alone for a while now. Thanks so much for your quick reply. I wasn't sure how many of you were left coasters and was worrying about the time difference. He's starting to poke out of his pipe a bit more, though still respirating heavily. I can't see any evidence of disease, but I'm still pretty new at this. Gills look good (aside from fast movement), fins and body all look good (no abrasions, bumps or spots I can see), eyes are clear (does that only matter when buying fish at the market to eat?). After my last message he looked like he was looking for a bit of food, so I dropped him another piece of pellet and it's gone now. I'm hoping (as a best case) he's just stressed, and that perhaps 10g with that equipment is just a bit too small for him? Hopefully the move will make him happy! Thanks again, I'll report back. Just a quick happy note to say that Kole is doing well. Still pretty shy, he only pokes out of the rock work for a few seconds at a time, but he's grazing on algae and even had a go at some of the mysis I dropped in this morning. He's still breathing a little heavy, but is looking great otherwise. Thanks, as always for the calm, comforting help. I got my Kole Tang 3 weeks ago. He's just now eating algae off the glass and rocks. For the past few days he's had these white marks in his eyes. 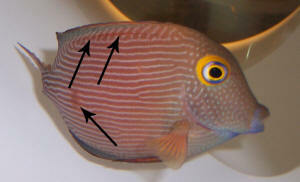 He also has a white spot between his bottom fin and tail. He's tail looks choppy too. You can see both in the pictures. The other fish are doing fine. and look good. <I'm going to assume you are asking what the white spots are and how to treat them. your fish has Ich. Read here, and the linked articles on the top of the page. There is only one white spot. It's bigger than what I have seen ich to look like. He hides all day long under the rocks. Could he have hurt himself or am I really dealing with ich? Well the Yellow eye Kole is on it last breath. I'm not sure what happened water conditions are good. I never saw him eat so I guess I'll blame it on that.